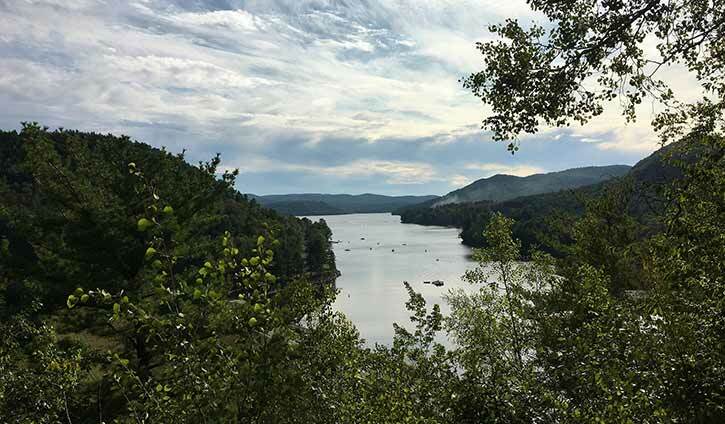 You won't want to skip a scenic drive up to the Adirondacks from Saratoga! Whether you're searching for an outdoor adventure or just want to get away from it all, here are some of our favorite things to do in the Adirondack Park. The Adirondack Park is the largest publicly protected area in the contiguous United States - bigger than Yellowstone, the Everglades, Glacier, and the Grand Canyon National Park combined! The six million acre tract includes 3,000 ponds and lakes, 2,000 miles of hiking trails, and 46 high peaks to discover. Want to hit the trails but don't feel like climbing an entire mountain? Try one of the easier hikes, like the LaChute River Walk Trail. One of many family-friendly trails in the region, the River Walk takes hikers right along the LaChute River connecting Lake George to Lake Champlain. Why not spend a day on the water? On sunny days, a scenic boat ride on Lake George is always a good choice. Or if you're looking for an adventure, head up to Lake Luzerne or North Creek for whitewater rafting and kayaking. Only 40 minutes north of Saratoga Springs, Lake Luzerne is home to the Adirondack Adventure Center, which offers lazy river tubing as well as treetop zip line courses! North Creek is about an hour north of Spa City, and just six minutes away from Gore Mountain ski resort. With its cozy base lodge and over 100 trails ranging in difficulty to explore, this mountain is a must for your next winter trip. The Adirondack region is also home to a number of restaurants, wineries, and breweries for you to check out before making the drive back down to Saratoga. About 40 minutes north in Warrensburg, the Grist Mill offers fine dining right on the beautiful Schroon River. On the search for that perfect craft beer? Consider taking a drive up to Paradox Brewery, about an hour away in Schroon Lake. Or if you're more of a wine lover, stop by the Adirondack style tasting room at Ledge Rock Hill Winery and Vineyard in Corinth, just a 20-minute drive from Saratoga. Lake Placid is a bit further north, clocking in at just under two hours from Saratoga, but definitely worth the drive! Not only will you pass through gorgeous Adirondack wilderness areas, but you can visit the site of the 1932 and 1980 Winter Olympics, ski or snowboard at Whiteface Mountain, or go window shopping along Main Street. At the end of your day, enjoy a delicious meal at the Whiteface Club and Resort's Moose Lodge Boathouse, a family-friendly restaurant with breathtaking mountain views. Whatever you choose, you'll be glad you made the trip to the Adirondacks! With so much to see and do, even one day in this beautiful region will provide memories to last a lifetime.